(NC)—The challenge in choosing exterior colour is to find the right balance between standing out and fitting in. Often the biggest colour decisions have been made by the time you get to choosing exterior paint colours: the brick, the stone elements, and your roof. To help you see these materials as colours, match each of them to a paint chip. 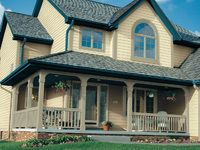 This is a quick and effective aid to developing your home's exterior palette. Add a paint chip for the roof and you are ready to go. Next, choose your main trim colour, and when you do, be extremely wary of white. There is very little white in nature so stark white can look artificial and inelegant. Be sure that any whites you use are what designers call “toned”whites like Moth Gray (PPG Pittsburgh Paints, 515–4) or Ashen (PPG Pittsburgh Paints 516–4). These look off–white or warm grey as paint chips but will still look very white against brick and stone. They're softer and more pleasing to the eye. Make the laws of colour perception work for you when assigning colours to the architectural features of your home. Light things grab our attention and they also tend to look big (which is why some of us favour black workout clothing). Take stock of your facade and assign the brightest trim colour to its most attractive trim features, such as decorative mouldings, window sashes, brackets, and columns. If you want to calm your façade then the rule of thumb is to reduce contrast. Tone down your trim with natural–looking neutrals in a deeper range of colours, like Sharkskin (PPG Pittsburgh Paints, 513–5) or Eiffel Tower (PPG Pittsburgh Paints 521–5), both the colour of stone. Make the details you want to be less visible recede with a warm off–black like PPG's Gibraltar Gray (530–6). These shadow colours help create harmony in your palette. Sometimes, toning down unattractive features won't be enough. To make utility doors, down–pipes and truly unsightly things disappear, you need outright camouflage. Use the colour that you matched to your main building material (brick, siding), as the colour for all ugly things. Dramatic or eye–catching accent colours should always be used sparingly. 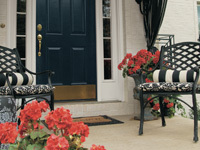 The front door – the welcome to your home – should be prominent, so this is where you can break loose. Classic reds, dark burgundies like PPG Pittsburgh Paints Burgundy Wine (534–7), and navy blues like their Black Flame (545–7), are magnificent, but also consider Autumn Fern (PPG Pittsburgh Paints 311–7), a khaki green that complements the rusty colour of red brick. If you prefer a monochromatic palette, add drama by choosing a really dark door colour like Sarsaparilla (PPG Pittsburgh Paints, 527–7) or Black Magic (PPG Pittsburgh Paints 518–7), both of which look handsome in a gloss finish. For shutters, you need to choose between blending them in and making them pop. To blend, use your shadow neutral. For pop, match your shutters to your door colour. This will draw more attention to your home so be sure your façade is up to it. White windows can be a curse. They are too bright to work well with brick or stone. If you are stuck with a brick house and white windows, then choose a toned white a little deeper than the white of your window frames and save your deeper shadow colour for areas non–adjacent to the windows. Invest in the highest–quality exterior paint you can afford. 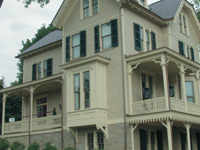 Painting the exterior is expensive, or time–consuming – usually, both. Look for an exterior paint that's backed by the strongest warranty you can find, like the Manor Hall Timeless line by PPG Pittsburgh Paints, which is backed by a lifetime warranty against cracking, peeling and flaking. At a premium of about $10 to $15 per gallon over standard exterior paints, this is a modest incremental investment set to deliver a big return.